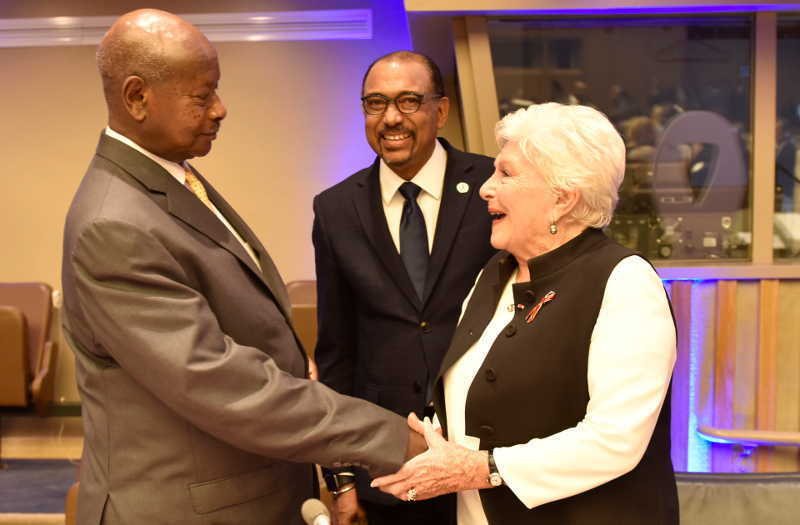 As part of his recent trip to the United States to attend the 72nd UN General Assembly, President Yoweri Museveni addressed a high-level meeting of Heads of States from Africa during which he urged them deepen commitment so as to end the epidemic by 2030. The meeting was co-hosted by UNAIDS and was attended by King Mswati III of Swaziland, President Arthur Peter Mutharika of the Republic of Malawi, President Danny Faure of Seychelles, President Edgar Chagwa Lungu of the Republic Zambia, and Mokgweetsi Masisi of Botswana. Museveni informed them about his recently unveiled Presidential Fast Track initiative to END AIDS in Uganda launched in July 2017, as a set of goals and actions with which Uganda hopes to end AIDS by 2030. He urged them adopt it saying that with increased commitment to research, prevention and treatment efforts, it is possible to end AIDS in its totality in a generation. Thank you all for accepting my invitation to attend this meeting on the important subject of HIV and AIDS. Let me salute my fellow Heads of State, Leaders of Government Delegations, AU Representatives from the African Union and other parts of the World who are here for this meeting. In a special way, I recognize the presence of Mr. Michel Sidibe, the Executive Director, UNAIDS, for the global stewardship of UNAIDS. I also thank the Secretary of State and other partners present here for the role they have played especially for responding to HIV and AIDS and for their global vision of ending AIDS by 2030. Your Excellencies, I have been interacting with our experts from the Ministry of Health, UNAIDS and other health partners about HIV transmission and prevention. Using lessons from our own experience in Uganda, we are now convinced that it is possible to eliminate HIV/AIDS in its totality. As part of this commitment, we agreed on ambitious global and national Fast Track targets for ending AIDS. We are in a better position because we now clearly know its mode of transmission, availability of anti-retroviral therapy with an improved outcome and advanced research that has been able to answer most questions. For example, research has shown that once you are on treatment, there is a reduced chance of spreading the HIV infection. For this reason, I invited you to address these challenges that face our countries and find means of how we can further strengthen our efforts. I shared this initiative with some African Heads of State at a side meeting during the African Union on 3rd July 2017 in Addis Ababa. The HIV prevention message has been rolled out to all government ministries, departments and agencies including local government authorities. The message has been tailored to target different sectors of the community. It was necessary to repackage the message because it had lost its vigor. The various categories of leaders are expected to further cascade the dissemination of these messages to lower levels. Globally 78 million people have been infected with HIV and that 35 million people have died from AIDS related illnesses since the start of the epidemic. (Approximately, 36.7 million people are estimated to be living with HIV/AIDS). Our region, sub-Sahara, is home to a disproportionate burden of the epidemic with approximately 25.5 million people living with HIV/AIDS. In Uganda, when the NRM came into government in 1986, we found the country grappling with several political and socio-economic problems including a new disease- AIDS which was causing serious sickness and deaths. Affected people like other in the region, were in denial about AIDS and as a result the response was that of silence as the disease ravaged and spread in the population. We immediately started the ABC campaign (Abstain, Be faithful and use of Condom where applicable). These were protracted campaigns to sensitize and educate the population about the disease – how it was transmitted and how it could be prevented so that our people would take measures to protect themselves from acquiring the infection. I was at the forefront educating the masses at every opportunity I got. We engaged different community, cultural and religious leaders to put AIDS on the agenda in their every interface with the population. Our efforts at different fronts yielded results that reduced the infection rate from about 30% in early 1990s to 6.4% in 2004. Thereafter, we got mixed and false messages that AIDS was no longer a big threat. Subsequently, our people relaxed and the epidemic raised up again to 7.3% in 2011. Our renewed and persistent effort to combat the disease has seen it reduce to 6.0% in the recent survey (2016). Additionally, in the last 5 years, the number of new HIV infections in the population have steadily declined in the new born. The annual number of new HIV infections have declined from 135,000, in 2010, to approximately 60,000 in 2016. I am happy to note that we are making good progress in the programs for elimination of Mother to Child Transmission of HIV. In 2016, the number of new mother-to-child HIV infections fell to 4,000 from 25,000 in 2010. This represents a decline of 86 percent during 2010- 2016 which is very commendable. This is, however, not acceptable and it must be brought further down. Unchecked AIDS pandemic is not only dangerous to the economy, of our nations, but also it impacts negatively affects on the labor force productivity. It is therefore, important that we must focus on prevention so that our population remains healthy, productive and subsequently contribute to economic growth of our continent. The Fast Track Initiative to END AIDS by 2030: Your Excellencies and Heads of delegations, during the special session of the United Nations in June 2016, we committed ourselves to the global UN commitment of ending AIDS as a public health threat by 2030. As part of this commitment, we agreed on ambitious global and national Fast Track targets for ending AIDS. We appreciate the active role of UNAIDS and other partners, always challenging us to accelerate the AIDS prevention response and leave none behind. We count on this unique partnership to fast track the response and achieve the end of AIDS as a public health threat. 5. Ensure institutional effectiveness for a well-coordinated multi-sectoral response. In conclusion, I call on our partners to continue affirming Global commitment and solidarity. It is time to jointly increase our commitments and resources to Fast Track the response to have the epidemic under control. I am confident that working together with you all, we shall attain this target of AIDS free Africa. It is “possible to END AIDS in our generation“. Doing that, requires commitment from our Government and I urge you to join me in ensuring that this target is attained.